The Animated Woman: Ford Nation. 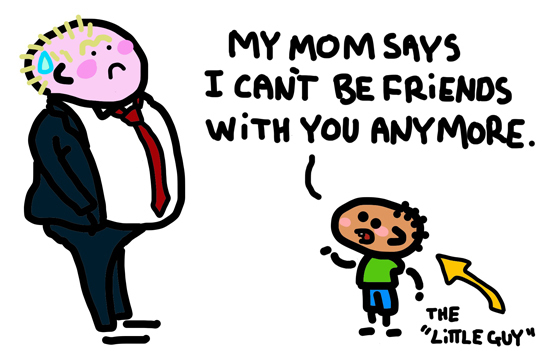 Mayor Rob Ford claims he stands up for the "little guy". But the average little guy in Ford Nation doesn't actually do crack. My kids wanted to know what was wrong with this strange man. They really can't understand why he's still the mayor of Toronto, where their cousins live. I explained that, yeah he's got a lot of problems that make him act that way, and yeah, it's not fair for all the people who live there, and yeah, the way the city's government works, they can't actually make him leave. And yeah, he's a really good example of what not to be. The kids suggested everyone should just ignore him; but I pointed out that some people still want him to be mayor. Maybe they want to hope? I have trouble understanding it myself. How do you explain something like this to kids? I love you and all the things you do. I love you too, hon. I wish I had something funnier here today to take your mind off of stuff. How? How can people still want him to be mayor? That's like Marion Barry, who was a three term mayor of Washington DC (capitol of the US), got arrested before his term was up for smoking crack that he bought off an FBI agent, made a comeback two years later on City Council, then became mayor again! He's back on the city council, is in trouble for not paying taxes and giving city contracts to his girlfriend. Are people so afraid of change and something new that they'll get comfortable with a crack head? I think there's a "better the devil you know" component at play. But the fundamental difference between Barry and Ford is that when Barry got caught, he apologized for real and stepped down, got treatment. With Ford, it's almost like he's a pathological liar with personality disorders, narcisist and antisocial, he's not really apologizing and not stepping down. Unbelievably selfish. And yeah, his base loves him no matter what. The worst part is that they're the ones who suffer most from his policies. Since I read this in my email, was just coming to comment about DC's mayor ... but oops there it is right above me ... this threw me when I first arrived in the States since they kept on showing the video of the man smoking crack .... strange stuff. It is bizzarre to me as well Nicole. Self-publishing a picture book is really fun! Rob Ford is OUT OF THIS WORLD! Rob Ford and the Future of Toronto.